When I first watched this film of Andrew Cotton’s journey to Nazaré, the level of danger involved in big wave surfing hit home when a surfer is pulled from the water and given CPR on the beach. As the lifeguards battle to save the man, the ocean’s apocalyptic roar booms admonition to those gathered on the shoreline. The sight alone of the mountainous swell unfolding at Nazaré should be warning enough to stay on steady ground, but to a rare spirit, the charging glacial walls and the explosions of the waves arrive not as a deadly warning, but as a furious challenge. Andrew Cotton, born and raised on the Devon Coast, has been charging in to the seas since the age of seven. As his skills developed, so did his taste for the big rides. He’d go on to help pioneer big wave spots in Ireland, and cast a big reputation as his focus turned south to Europe and spots like the aforementioned Nazaré in Portugal. A wave is a hard thing to measure, and whilst there stands an official record, held by the American Garrett McNamara for the largest ever surfed, debate rages over whether this has been bettered. Cotton is one of those thrust forward by the media as having traversed the face of record challenging waves. Whilst wave sizes are debateable, the size of Cotton’s character is not. The Terrestrial caught up with Andrew Cotton, big wave surfer, family man, sometimes plumber, full time legend. TT: Tell us about your background in surfing, and how you chose to focus on big waves? AC: The big wave focus just kind of happened naturally. I've always surfed since I was young and as every grom does, dreamed of being pro! I worked in a surfboard factory for 10 years after leaving school at 16 and travelled for 3 months every winter, then repped for a wetsuit brand and also managed surf shops; anything to spend as much time in the sea as possible. I re-trained as a plumber after being fed up with being broke. I worked as a plumber full time for 8 months which was when I decided money wasn't that important and I'd rather surf more. TT: What was your first big wave experience? AC: My first real experience was probably Waimea Bay in Hawaii when I was about 19 or 20. I still remember the session vividly. TT: What constitutes a big wave, is there height threshold? AC: No idea! 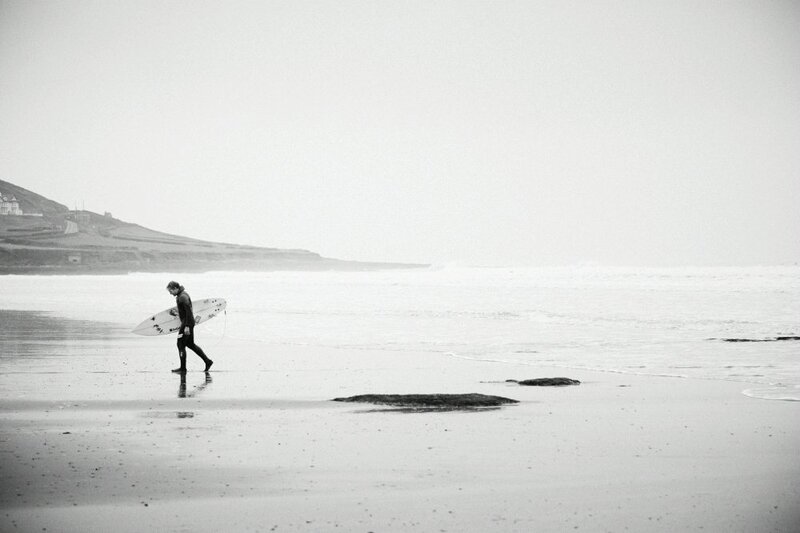 Everyone has a different threshold which is the cool thing about surfing. An 8-10ft wave is big and can definitely scare you but you probably wouldn't class that as a big wave! TT. How do you identify when big swells are due? AC: Every surfer is a bit of a weather geek and there are so many good surf forecast sites now. So I spend a lot of time looking at predicted data and weather patterns. It's just knowing where you want to surf that can be the problem; sometimes as you can't be everywhere! TT: What's your process when you get to the location? Is it a case of just getting out there and waiting, or do you follow a system? AC: Every location is different and has unique conditions which I'll be looking for. There's no set process as every swell is different but I do have different rituals at different spots. Like in Nazaré (Portugal) I like to watch the waves from the cliff as long as possible, whereas at Mullaghmore in Ireland I'd rather watch the waves from the channel before surfing. Watching the waves from the headland there really scares me. TT: How do compose yourself when you take a fall in rough conditions? What's it like to be trapped under the waves? AC: I've got a lot of experience at falling off! The key is not to panic; I sort of go into a zone and relax into it. I have a breathing pattern which I do to prepare my body and help settle nerves, which is belly breathing, 3 seconds in and 10 seconds out. It helps a lot. TT: What was your biggest wave? AC: Not sure to be honest, although I'm pretty focused on riding the biggest waves I'm not 100% on how we actually measure them accurately. At the end of the day there’s big, some are very big and others massive! TT: What drives you on? AC: Loads of things inspire me to do well and achieve. I have goals every season which I write down; it helps me focus towards what I want and is important that year. Also doing video projects is a great help, I get to watch my surfing and see what I'm doing wrong and where I can improve. At the end of the day I'm constantly looking to improve my big wave surfing, whether it's my boards, safety equipment, fitness or mental state. Every little bit helps. Want more? Check out Andrew Cotton’s new series Behind The Lines at Redbull.com and follow his exploits on Instagram and Twitter.